Amaranthine Flowers By Design`s Sunshine Delight is a flower delivery sure to brighten any room. 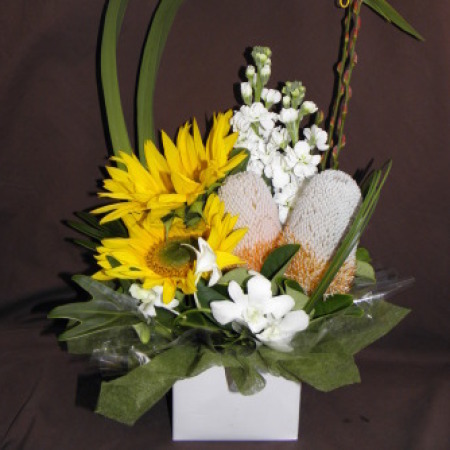 Filled with fragrance from the gorgeous white stock, the happy yellow sunflowers, the Australian native banksia, and long lasting singapore orchids, a modern floral design with tropical leaves, foliages and sticks. Sunshine Delight is a wonderful gift for any home, office or hospital room. A unique arrangement from Newcastle`s Amaranthine Flowers By Design. Your local florist in New Lambton, Newcastle.